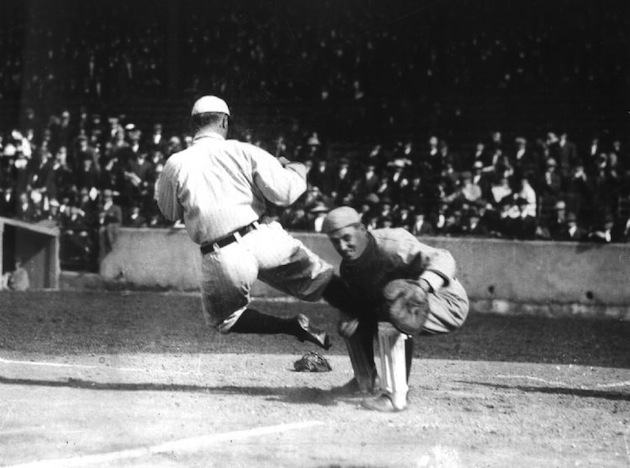 Ty Cobb goes “spike’s up” into home. Navin Field, Detroit (1912 or 1913). Public Domain image. As a baseball-writing massage therapist with nearly 10,000 massage sessions under my belt, I’m often asked for my thoughts about home plate collisions. But, I’m going to tell you anyway. 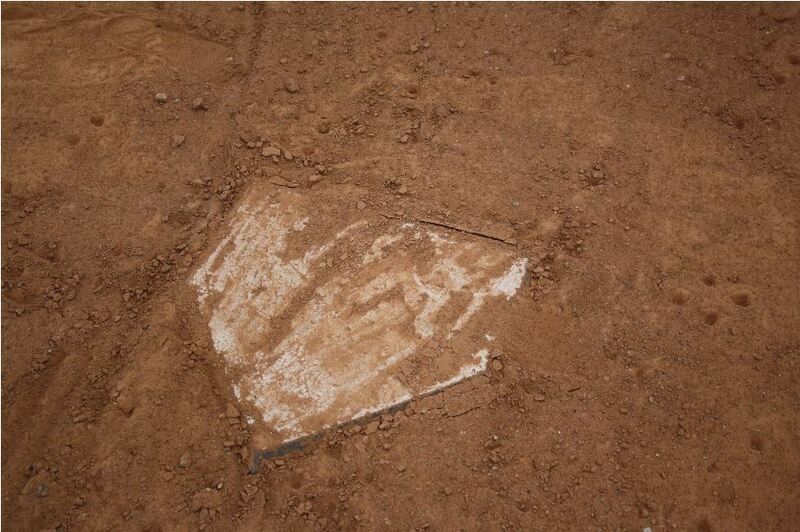 Because I’ve been thinking a lot about home plate ever since my last post. Glenn Beck doesn’t know what he’s talking about. I know collisions. I see colliders every day. Colliders are my massage (and Yoga) bread and butter. I have clients who have collided with other people, with airbags, with telephone poles, with staircases, with the ground (woody, gravelly, asphalty, rocky, and cementy.) I see clients who have broken things, strained things, torn things, ruptured things, and gotten their bells rung. I sometimes see them a day after they have collided and often for years afterward. I see equestrian clients who are tossed off of their horses so often that you would think their bottoms are loaded with crazy Wonderland-like springs that catapult them randomly through the air and into rocks and bramble. Over and over. I have clients who live with chronic pain and permanent injuries and brain impairment because they collided into something – or someone – else. So, I am delighted that Major League Baseball is taking the necessary steps to ban home plate collisions – where a base runner coming home seeks to dislodge the ball from a catcher’s mitt by violently colliding with him. That’s how the Giants’ Buster Posey broke his leg in 2011. And, that’s how many professional ballplayers sustain debilitating concussions throughout the season. Home plate collisions are needlessly dangerous, unnecessary, and just plain stupid. Former Catcher and now St. Louis Cardinals Manager Mike Matheny retired in 2007 following a series of concussions caused by home plate collisions. He lost 18 months of his memory as a result. If I haven’t convinced you, listen to him, click here. Baseball’s owners and the players’ union are still working out the details and wording, but the belief is that new rules could be in place by the start of this season or 2015 at the latest. • Catchers cannot block home plate. • Runners will not be allowed to target the catchers. • Players who violate these rules will be subject to disciplinary action. This won’t eliminate all collisions. But, it will eliminate some extremely violent home-plate encounters. In its very earliest long-time-ago incarnations, baseball required a runner to be struck by the ball in order to be out. Yes, just like dodgeball you would throw the baseball at the runner – as hard as you could and sometimes right at his head. If you severely maimed him in the process, well, hey, it was the 18th century, he probably wasn’t going to make it to 40 anyway. But, that was stupid. And, baseball improved its rules. Watch the PBS Frontline documentary League of Denial that shows, in grim detail, the heartbreaking damage that concussions have done to professional athletes. Watch it here. Glenn Beck, apparently, thinks that baseball rules are unnecessary (in the same way that he believes that government is unnecessary, until the potholes on his street need fixing). Life has risks. Games have risks. Jobs have risks. But, that doesn’t mean that an employer doesn’t have the responsibility to try to eliminate risks whenever possible. A bakery gives its baker an oven mitt so he doesn’t melt the skin off his hands when he pulls the bread out of a hot oven. A warehouse puts brakes on its forklift so a driver doesn’t run over his colleague who is stacking boxes. Baseball stops home plate collisions. Good heavens, why are we even debating this? But, tough. And, stop whining. Just 25 days until pitchers and catchers report. This entry was posted in Baseball, Baseball History, Life and tagged concussions, Home, plate collisions, Ty Cobb by Jackie, The Baseball Bloggess. Bookmark the permalink. You go, girl! Any sport that allows players to purposely damage other players ought to be permitted only in the Colosseum in Rome while the lions are loose. What an informative write-up. What you say makes sense. Carry on! Thank you Elizabeth! The Frontline piece is very well done and incredibly damning and heartbreaking. No surprise that ESPN pulled its name from the documentary at the last minute … the rumor is that the NFL put the screws to them. Great article Jackie! So just to stir the pot a little, I”m not super happy with the new collision rule. I agree with everything you said, but my concern is that if the catcher is able to block the plate with the ball as he waits for the base runner, it puts the base runner at risk of injury. There needs to be a corollary the the catcher has to give the runner access to the plate if there is a play at home. This of course will create a nightmare for umpires, in trying to determine if the catcher blocked the plate or not. I’m not sure that this is included in the official rule document (I haven’t read it) but it should be. It’s definitely one of those things that will take a little while to work out the kinks. btw, the reason I feel strongly about including a corollary is that it happened to me 2 seasons ago when I slid into home (we also have a no collision rule). The catcher blocked the plate and I slid into his shin guard (it was between me and the plate; no opportunity for a hook slide). He didn’t budge. It was like sliding into a fire hydrant! My shin, then my foot turned into a lovely eggplant color. Honestly i think I still have nerve damage! Not begrudging the catcher, but I”m just making the point that the league needs to consider baserunner as well as catcher safety at home! Hi Jan … Thank you! You are absolutely right! And, from what I’ve read catchers will not be allowed to block the plate — and umpires will have to determine if their stance protecting the plate impedes the runner or creates a dangerous situation. They haven’t agreed on the final wording of the rules, but Buster Olney reports that both instances of home plate collisions will be banned — when a runner collides willfully or when a catcher blocks the plate. I realized after I posted this that most of the examples out there are from the runner’s colliding with catchers … but your experience isn’t rare, either. Catchers will have to be responsible, too. Ty Cobb was awesome, but also a complete psychopath off the field. I don’t like Glenn Beck, despite being a so-called right winger. And I definitely don’t like the new rules not allowing collisions at home plate. HOWEVER…I do understand your point and I knew it was inevitable that it would happen. Especially after the Posey incident. Which I didn’t feel bad about because he was a Giant, oh the hated Giants! But I did feel bad about it for him because he’s a human being and that looked extremely painful. I couldn’t watch the replays. So it’s here and your perspective as always makes me accept it better! Well, you know, I’m Team Buster! But, I’ll cede the occasional broken bone as an acceptable risk in sports. But, I think home plate collisions are unnecessary and dramatically raise the risk of concussions. Concussions can have a serious and lasting impact on the brain, and I just think we need to minimize that brain injury risk … in all sports. Jackie – I stumbled on this post while looking for the photo of Cobb and Paul Krichell in either 1911 or 1912 (Krichell wasn’t in the majors in 1913). There are a couple of things I felt were worthy of comment upon. As for the injury to Buster Posey, yes, it was awful. I was terribly sorry he was hurt. However, hall of fame catcher Johnny Bench laid a significant percentage of the blame for that injury on Posey himself. His position was wrong, he was stationary, rather than crouching or upright, and according to one writer the only way Posey could have made it worse was to have dragged a mattress out to the plate and taken a nap waiting for Cousins to come down the line. Baseball making a change to the rule on collisions at the plate and at second base is a good thing, as it cuts down the chance for something so dangerous to not have consequences in the rule book. Having said that, let’s keep in mind that every play in baseball begins with one player taking an object as hard as a rock and throwing it near another player at speeds over 100 mph. The number of batters hit every year far outweighs the number of plate collisions. When you’re looking to limit injuries, which is a noble cause, it’s relevant I believe to remember both Herb Score and Tony Conigliaro. Yes, I very much remember Ray Fosse, and what happened to him in an All-Star game of all places. The other two life altering injuries, along with Ray Chapman’s death are no less horrific. Hi Ken … thank you for your thoughtful comments. You are right — baseball has its risks. I always supports efforts to minimize the risks when possible and to eliminate plays or actions that are devised primarily to injure or take a player out of a play. My football friends often argue that baseball players often incur concussions, broken bones, and other injuries. And, those injuries happen and can’t be completely eliminated. The difference is that, unlike football, the goal of baseball is not to impede an opponent’s progress with force. In football, tackles and sacks that lead to trauma are the rules of the game. I recognize that not all hit batters are accidents. And, that troubles me and I hope that baseball will be tougher on pitchers who willfully hit batters. I’m grateful for the additional protection that batters wear … and the continuing efforts to make better and more effective protection. I am also concerned about the regular trauma that comes to a catcher when taking foul balls off of his mask or body. The cumulative impact of that may be just as injurious as a home plate collision. There are no simple cut-and-tried solutions, but I’m pleased that baseball continues to look at ways to improve the safety for its players.